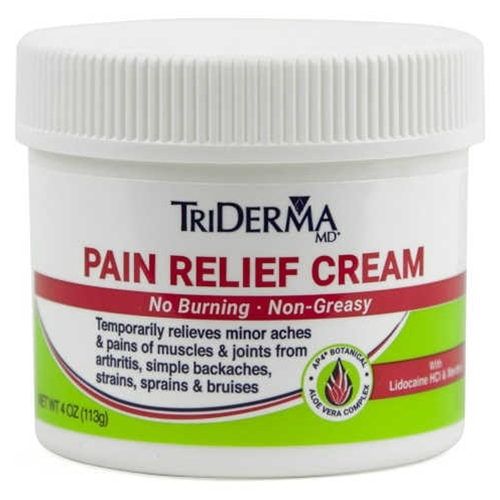 TriDerma MD Pain Relief Cream from HealthyKin.com provides long lasting comfort and fast relief for pain without burning or irritating skin. Each botanical ingredient was chosen for its natural pain relieving and anti-inflammatory properties which are recognized by the Homeopathic Pharmacopoeia of the United States. It combines the best of nature, science and clinically proven pain relievers to help relieve pain so you can get on with your day. I have tried so many different "pain" creams that I could open a dairy! However, TriDerma MD Pain Relief Cream is the one that works BEST for my shingles shoulder pain. At this point I plan to keep buying it. Works better than just about any other "pain" cream I tried. ( I think it's the small amount of lidocaine in it. And, maybe, the menthol) I plan to keep buying it. Thank you healthkin for such a great product. My mother has been using the Triderma pain cream for a month now. She loves the product. She quotes "a little goes a long way"end quote.